Do you struggle to fit everything you need to get done into your work day? Do you have a hard time figuring out what you need to do next? Are you always worried that something is falling through the cracks – and you’re not even sure what? Have you missed a deadlines, meetings, or appointments? Do you always feel like you’re multitasking – flitting from task to task without ever actually finishing anything? If you answered an emphatic YES to any of these questions, you need a block schedule. It’s time to take control of your work day, be more productive, and get more done. 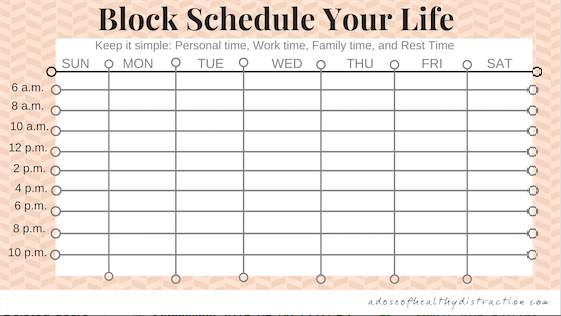 A block schedule is a way to stack your day (and everything you have to get done) into laser focused, easily manageable blocks of time. You get to decide when you meet with clients, work on projects, market and network, all in a structured, regular schedule. How Do I Create a Block Schedule? Don’t worry – it’s not as hard as it might sound. Before we get started, I want to share a few tips to help you get the most out of this exercise. Leave the perfectionism at the door. This exercise isn’t about perfection; it’s about creating a simple tool to help you take control of your day, and ultimately, your life. Don’t get too hung up on making it perfect. Focus on finishing the first draft of your schedule and remember, sometimes good enough is good enough. Change is inevitable. Your block schedule is never going to be “done” so you might as well just accept that now. You are a business owner with a personal life. Your priorities will shift with your personal, professional, and financial goals. You will hire, fire, grow, move, add a practice area, bring on a partner, and on and on and on. You will probably be tweaking your original block schedule as these new priorities surface. That’s okay. Be realistic. Be honest with yourself about everything you have to do in a day, how long those things actually take you, and when you feel your best. I know you need to meet with clients and return phone calls, but you also need to eat. You will be a happier, healthier human being if you take a few minutes for yourself throughout the day – and happy lawyers do more good in the world. Let’s make a list of all of the things you need to get done during your work week. Take 5 – 10 minutes and jot down everything that comes to mind. Time to work on the business – budget, business plan, marketing plan, etc. Now, think about how long it takes you to accomplish these things. Let’s start with client meetings. Maybe your initial consult often takes two hours, but your final meeting with clients only lasts an hour. You usually meet with 5 – 6 clients per week. Jot that down so we can build those blocks into your schedule. Take 5 – 10 minutes to finish up. Networking – 2 – 3 hours to teach a seminar, attend an event, etc. When Do I Rock It? Got that part done? Great! Now that you’ve made your list, it’s time to think about when you feel your best to tackle these things. Take a few minutes and think about when you usually feel motivated, focused, and engaged in each of the items on your list. Again, be realistic. If you’re not a morning person, it’s probably not the best idea to meet a colleague for an early coffee on Monday morning. Plan for networking lunches instead. If you usually have court on Thursdays, it would be impossible to meet with clients that day. Maybe Wednesdays is the best day for you to schedule your client meetings. You can’t have team meetings on Fridays because one of your team member’s only works part time and isn’t in the office on Fridays. Staff meetings earlier in the week would be more productive. You get to build what works for you. That’s the beauty of this. Mondays are for getting the work done. This is the day to meet with your team, prepare for the week ahead, and tackle any outstanding legal work, case by case, project by project. Tuesdays and Thursdays are for meeting with clients. Wednesdays are for getting out from behind your desk. Schedule a networking lunch, teach a seminar, attend a colleague’s open house. What you do is up to you – just get out from behind your desk. Fridays are special. On the 1st and 3rd Fridays of the month, you get to take the day off. On the 2nd and 4th Fridays of the month, you need to work on the business. This is when you should do things like update your budget, improve your business plan, and work on your marketing plan. I’ve built a sample block schedule and included all of the things we’ve talked about so far. Feel free to take it and make it your own. Click here to download a sample block schedule (.xlsx). Next week, I’ll talk about implementing your new block schedule and how to actually stick to it. After all, it’s a huge accomplishment to get your block schedule written down on paper, but it’s totally useless if you don’t actually use it. In the meantime, work on building your schedule. How will you use your 168 hours this week? This entry was posted in Guest Bloggers and tagged Candace Wells. Bookmark the permalink. This is genius! Easier said than done, but still. It does take a little trial and error, Suzanne – but the results are a game changer! Any thoughts on implementing a time block schedule when court appearances are a regular part of your weekly schedule? Yes. You should block out those regular (short) calendar days for court appearances and remain fluid for when you know you don’t have to appear in court. This is what I used to do. If you are in court at a moment’s notice daily, this could be a challenge but court calendars do you give you notice of time. Remember, it is an art form which eventually becomes a structure that still has to remain dynamic.